Find hotel near The Old Inn, Carbost, Isl .. 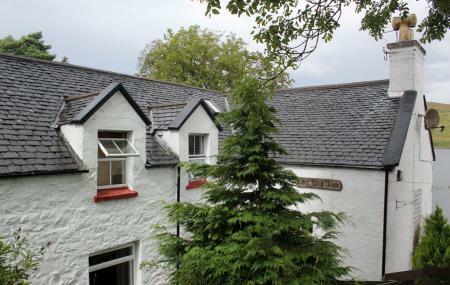 Experience Scottish culture at the renowned Old Inn, situated in Carbost. Situated on the shores of Loch Harport, it is a free house pub that serves drinks as well highland dishes. You can also book a room and stay in its old structure to revel in a complete Scottish highland experience. This pub is located in an idyllic landscape and offers beautiful views of the Loch and Cuillian hills. The Inn hosts open Jam sessions on Friday nights. How popular is The Old Inn, Carbost, Isle Of Skye? People normally club together Fairy Pools and Talisker Distillery while planning their visit to The Old Inn, Carbost, Isle Of Skye. What a find! Voted the best pub on Skye. It sure deserves this award. A warm welcoming relaxed ambience . Roaring log fire. Delicious food made fresh on the premises. The burgers are handmade, with a choice of toppings. The fish and chips are 1st class. We also enjoyed the best Sunday roast we've had anywhere. You made our holiday. We will be back .. Sally and Dave. Went in for a quick lunch. The burger and the fries were great. The meat was tasty and the other ingredients were good as well. The relish was also nice, I think it is some home made stuff. The barkeeper was a nice guy. The atmosphere of the pub is great. Nice B&B on Skye. Not the best food and the bar keeper wasn't as friendly as it could be expected. At the cell phone they told us they're fully booked. Nevertheless, as we were there for dinner and asked again for accommodation they had more than enough space for all 6 people. Despite it being busy we were able to find a table quite quickly. Very friendly staff, lovely atmosphere and great to be so close to the Loch! I enjoyed my falafal burger and my partner enjoyed his fish and chips - he doesn't normally eat much batter but he said this was really tasty!